In Ayurveda, it is saying that one can get many benefits by drinking water in copper glass. The bad elements come out such as gout, bile and cough from the body. The water which is kept in copper has the quality to control these three problems. This water is known as Tamra Water. The water is beneficial only when you keep it in copper urn, jug or glass for 8 hours. Following are the benefits of water which is kept in copper glass. 1. Removes Bacteria: Copper is known as oligodyanamic (Sterilization on bacteria) in nature. One can easily killed bacteria by drinking this water. It also killed germs of diarrhea and jaundice. But water should be clean and clear. 2. Controls the Thyroid: Experts believes that copper water controls the thyroid and it also controls its working condition. Diseases can be cured by drinking copper water but water should be clean. 3. Removes the inflammation of Gout and Joint pain: One can get benefit in gout and joint pain problems by drinking copper water. Copper decrease the uric acid in body and so gout problem also can be solved. 4. Healthy Skin: Copper water makes clear and clear skin. You can get smooth skin by drinking copper water in morning. 5. Anti-Aging: Everyone has problem of anti aging. They want their signs of increasing age can be hidden. If you also want this then you can drink copper water. It removes wrinkles and flabbiness in skin. It removes dead skin and new skin will come out. 6. Improves Digestion System: A person can get relief in acidity or gas or stomach problem by drinking copper water. 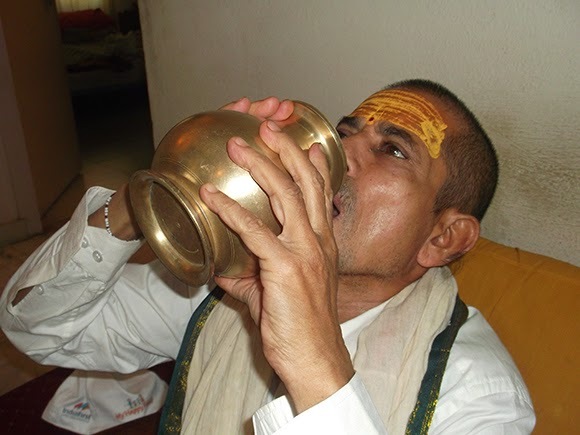 According to Ayurveda, if you want to throw out poisonous elements from body then you should drink copper water which is kept for 8 hours in copper glass. It gives you relief and solves the problem. 7. Reduce Weight: Anyone who wants to reduce the weight they have to drink copper water. It removes the extra fat and they do not get deficit and weakness. It also removes stress of the body. 8. Removes Deficit of Blood: The fact of copper is very strange that it is very necessary in most of the procedures in the body. It absorbed the necessary nutrition in the body. Blood disorder can be cured by drinking copper water. 9. Healthy Heart and Removes Hypertension: A person who has heart problem then he can keep water in copper glass in night and drink in the morning. He can get many benefits. It circulates the blood easily in the body. 10. Help to fight with Cancer: A person who has cancer they have to drink copper water as it gives too much benefit. It removes gout, bile and cough problems. It has anti-oxidant which gives energy to fight with cancer. According to American Cancer Society, copper help cancer patient in many ways. This metal is beneficial and the water which is kept in it gives benefits. It gives anti cancer effect.